CoQ10 strengthens the heart muscle tissues, but it also helps other major organs. As an antioxidant, it protects LDL cholesterol from oxidation, thereby helping to maintain the tone and integrity of blood vessels. Your heart pumps approximately 2,000 gallons of blood throughout the body every day. As the hardest-working muscle in your body and the circulatory system’s main control centre, your heart requires a significant amount of energy to function properly. That energy is made available with the help of a nutrient called coenzyme Q10 (CoQ10), which also plays a role in supporting blood vessel health. CoQ10 is produced naturally by the body and is present in all cells. Dietary intake helps maintain CoQ10 levels; however, the amount of CoQ10 consumed from foods is typically less than 10 mg a day. More important, factors such as poor diet, aging, and daily exposure to free radicals may increase the need for this crucial nutrient. We stand behind each and every one of our products. The ingredients, purity, safety, and performance of all our Healthy Nutrition, Healthy Weight, Healthy Home, and Healthy Beauty products are 100% guaranteed. CoQ10 is a fat-soluble nutrient produced in the body and present in all cells. Higher concentrations of this nutrient are found in organs that work extra hard and require a significant amount of cellular energy to function, such as the heart, liver, kidneys, and pancreas. CoQ10 is vital to the trillions of cells in the body that must make their own energy to survive. To make energy, cells burn sugars and fats that come from the foods we eat. These nutrients are broken down and carried through an energy-producing pathway that requires CoQ10. This energy-producing process is repeated thousands of times a second and fuels your beating heart and other body organs that require a continuous flow of energy. Without CoQ10, cells would not be able to produce energy and organs would not be able to function properly. CoQ10 is also known for its potent antioxidant activity, protecting cell membranes from free radicals. As an antioxidant, CoQ10 helps protect arteries against the oxidation of low density lipoproteins (LDL). This is important, as it helps promote the function of blood vessels including those that transport blood to the heart. Resveratrol is a phytonutrient found in red wine, red-grape skins, and purple grape juice. Like CoQ10, resveratrol plays a role in heart and blood vessel health. In laboratory studies, resveratrol has been shown to help reduce the oxidation of LDL and to promote blood vessel relaxation. The more relaxed blood vessels are, the wider they open to promote healthy blood flow. Dietary intake helps maintain CoQ10 levels. However, the amount of CoQ10 consumed from foods is typically less than 10 mg a day. Watch what you eat. A diet low in saturated fat, trans fat, cholesterol, and sodium – but high in fibre – promotes a healthy heart. Achieve a healthy weight. Too many calories and not enough exercise can promote weight gain. Modest weight loss of 5% to 10% of your weight can improve heart health, if overweight. Stay active. Get at least 30 minutes of exercise each day. Even a simple but brisk walk can make a big difference. Don’t smoke. Smoking makes your heart work harder and can increase blood pressure. Laugh more. Studies show laughing can relax blood vessels and contribute to a healthy heart. Take your supplements. 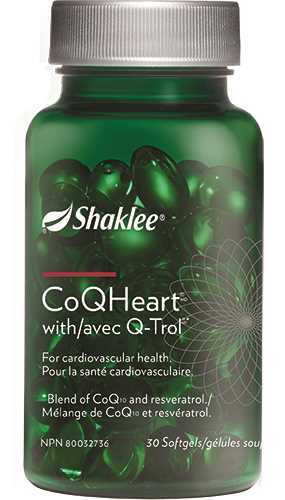 Supplement your diet with CoQHeart, which delivers 100 mg of CoQ10 plus resveratrol in a bioavailable softgel. Raitakari OT, McCredie RJ, Witting P, et al. Coenzyme Q10 improves LDL resistance to ex vivo oxidation but does not enhance endothelial function in hypercholesterolemic young adults. Free Radical Biol. Med. 2000;28(7):1100-5. Zhang H, Morgan B, Potter BJ, Ma L, Dellsperger KC, Ungvari Z, Zhang C. Resveratrol improves left ventricular diastolic relaxation in type 2 diabetes by inhibiting oxidative/nitrative stress: in vivo demonstration with magnetic resonance imaging. Am J Physiol Heart Circ Physiol. 2010 Oct;299(4):H985-94.